New York Times Video shares Goshen Film on their Video Channel. We feel extremely hyped that we just won Best Environmental Feature at the Mountain Film Festival! The film festival's mission is to enlighten, celebrate, and enrich. "The Mountain Film Festival fosters appreciation for the art of movie making and its power to inspire and communicate a richness of ideas and cultures. The Mountain Film Festival along with its Mountain Film Awards, were created as a platform to provide recognition to the most finely made and exemplary films, screenplays, and those filmmakers, writers, and artists who demonstrate excellence and originality in their work and crafts." This is Goshen's 8th accolade! So thank you Mountain Film Festival for the award and recognition! We are honored that FMTV has selected Goshen to be a part of their health and wellness documentaries. We hope that this exposure will bring awareness to the Tarahumara and the issues their culture is facing! Have you heard of FMTV? If not, now’s the time! Think Netflix® but for all things health & wellness. FMTV has a bucket load of EXCLUSIVE FILMS YOU WON'T FIND ANYWHERE ELSE! Not every great film makes it to iTunes or Netflix or Hulu...FMTV is working with independent filmmakers (like us), bringing the greatest collection of high-quality unique health and wellness content (like Goshen) to you inside FMTV. Over 70% of the unique films are not on NetFlix or iTunes! Sign up for a FREE 10 day trial and gain instant access to a growing-library of over 400 films, documentaries, recipes, yoga classes, exercise routines, expert interviews and more! Why do you want to sign up today? You will be able to watch Goshen Film, streaming for FREE on FMTV starting October 16, 2015! This past week, we received the Prestige Film Award for Women Filmmakers. Only 4 months after our film's release, Goshen has gone on to win 5 awards and is an official selection in 2 film festivals! On April 4, Dana & Sarah Films premiered their award winning documentary GOSHEN: Places of Refuge for the Running People. The powerful film is an entertaining and educational account of the plant-based diet and athletic endurance of the Tarahumara running tribe. On April 4, Dana & Sarah Films premiered a new documentary about the Tarahumara running tribe. 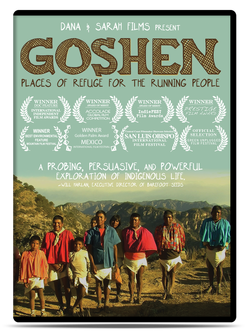 The film titled GOSHEN: Places of Refuge for the Running People was directed and produced by Dana Richardson and Sarah Zentz. The film shares an eye opening investigation of the Tarahumara people’s unique diet, ultra-running endurance, and natural running with minimal footwear. The Tarahumara Tribe of Mexico’s Copper Canyons was famous worldwide for their ability to run long distances. They are also known for the low risk of health diseases such as cancer, cardiovascular disease and diabetes - which is due to their plant based diet and active lifestyle.